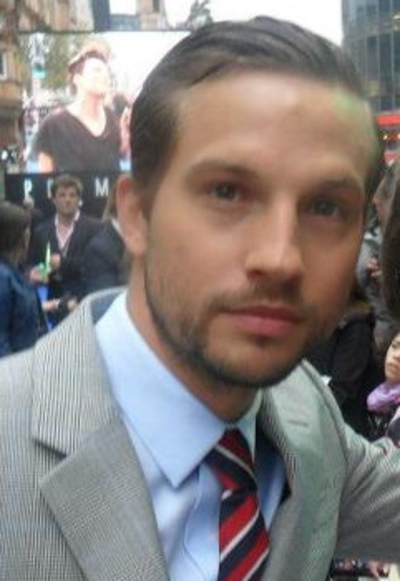 Logan Marshall-Green (born November 1, 1976) is an American actor. He is known for his roles in the television series 24, The O.C., Traveler, Dark Blue, and Quarry, and as Charlie Holloway in the 2012 Ridley Scott film Prometheus. He will appear in Spider-Man: Homecoming as Jackson Brice. Marshall-Green was born in Charleston, South Carolina, and was raised by his mother, Lowry Marshall, in Cranston, Rhode Island. He has a twin brother named Taylor. They both attended Barrington High School (Barrington, Rhode Island) for a period of time in the early 1990s. Marshall-Green did his undergraduate studies at the University of Tennessee, Knoxville, where he also wrote for the school newspaper, The Daily Beacon, as an entertainment writer covering the bar, music, and theater scene. He attended the National Theater Institute in Waterford, Connecticut and then went on to earn his Master's in Fine Arts from New York University's Graduate Acting Program at the Tisch School of the Arts. Marshall-Green is married to actress Diane Marshall-Green. The couple have two children, daughter Culla Mae Marshall-Green (born April 6, 2010), and son Tennessee Logan Marshall-Green (born April 11, 2014). Marshall-Green appeared in both Law & Order: Special Victims Unit in 2003 and Law & Order in 2004, before landing recurring roles on Fox's The O.C. and 24. Marshall-Green received a Drama Desk Award for his performance in Neil LaBute's play The Distance from Here in 2004. In 2005 he performed in three separate productions: in June he played an anthropomorphic shark in Adam Bock's Swimming in the Shallows; in August he appeared as Bo Decker in a production of William Inge's classic Bus Stop; and in December he was Beethoven in the Peanuts spoof Dog Sees God: Confessions of a Teenage Blockhead. In 2007, he was cast as the villainous Edmund in the Public Theater production of King Lear starring Kevin Kline in the title role and directed by James Lapine. In 2005, Marshall-Green appeared in the film Alchemy. That same year he also appeared in the Miramax film The Great Raid. Marshall-Green portrayed Tyler Fog in the 2007 ABC series Traveler. He appeared as Paco in the 2007 film Across the Universe. Marshall-Green featured as Dean Bendis, an undercover police officer, in a black ops group of the LAPD headed by Dylan McDermott in the TNT series Dark Blue. He also worked alongside Richard Gere, Ethan Hawke, Don Cheadle, and Wesley Snipes in the 2010 criminal drama Brooklyn's Finest directed by Antoine Fuqua. He played Melvin Panton, a young rookie cop who disagrees with the ways of Richard Gere's character a soon to be retired cop Eddie. Marshall-Green played one of the leads in the Universal Pictures thriller film Devil. He also portrayed with the role of Will, the leading role in Karyn Kusama's thriller The Invitation. Marshall-Green appeared in the Ridley Scott film Prometheus as Holloway, a crew member aboard Prometheus. It was announced in 2016 that Marshall-Green would be joining the cast of Damnation.